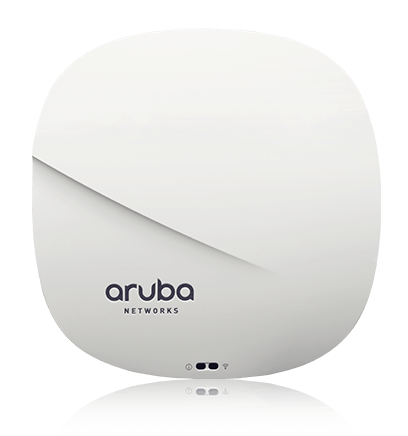 The Aruba 330 Series access points provide the fastest gigabit data speeds and superb user experience for mobile devices and applications in a digital workplace. Designed with an integrated HPE Smart Rate port to scale up to 5Gbps Ethernet over existing copper, the 330 Series allows enterprises to leverage their multi-gigabit Ethernet wired network infrastructures to eliminate bottlenecks. Leverage wired multi-gig NBASE-T™-compatible Ethernet infrastructure to eliminate bottlenecks in high-density environments. Aruba ClientMatch software groups Wave 2 clients together, enabling 4x4:4SS MU-MIMO. That means a faster, more efficient network. 330 series APs have an integrated BLE Beacon to simplify management of a large-scale network of battery-powered Aruba Beacons. The Aruba 330 Series APs offer a choice of operating modes to meet your unique management and deployment requirements. Controller-managed mode – When managed by Aruba Mobility Controllers, Aruba 330 Series APs offer centralized configuration, data encryption, policy enforcement and network services, as well as distributed and centralized traffic forwarding. Aruba Instant mode – In Aruba Instant mode, a single AP automatically distributes the network configuration to other Instant APs in the WLAN. Simply power-up one Instant AP, configure it over the air, and plug in the other APs – the entire process takes about five minutes. If WLAN requirements change, a built-in migration path allows the 330 Series Instant APs to become part of a WLAN that is managed by a Mobility Controller. Four integrated 2.4 GHz downtilt omni-directional antennas for 4x4 MIMO with maximum antenna gain of 3.8 dBi per antenna. Each 5 GHz radio chain has both a vertically and a horizontally polarized antenna element; AP software automatically and dynamically selects the best set of elements for each data packet transmitted or received. Four integrated vertically polarized 5 GHz downtilt omni-directional antennas for 4x4 MIMO with maximum antenna gain of 4.9 dBi per antenna. Four integrated horizontally polarized 5 GHz downtilt omni-directional antennas for 4x4 MIMO with maximum antenna gain of 5.7 dBi per antenna. Built-in antennas are optimized for horizontal ceiling mounted orientation of the AP. The downtilt angle for maximum gain is roughly 30 degrees. The maximum gain of the combined (summed) antenna patterns for all elements operating in the same band is 1.6 dBi in 2.4 GHz and 2.5 dBi in 5 GHz. IAP 335's - Auth Failure - Reason is resource constrained. How to change the radio mode of an AP-335 from AM to Access?